Image below: Mother and son, both competitors at the international seniors’ Olympics. 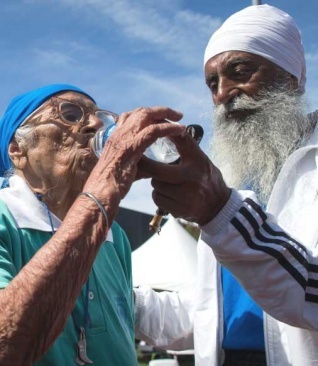 The 101-year-old Sardarni from Chandigarh, Punjab, has made history at this year's World Masters Games in Auckland, New Zealand, as the oldest female athlete to win a gold medal in the 100-meter race. She's the oldest athlete at the multi-sport event, which has been labeled by many as the Olympics for veterans and seniors. Held every four years, the World Masters Games is for people of varying abilities who are, generally, age 35 or over. Mann Kaur competed in multiple events at the games, winning the 100-meter dash in 74 seconds on Monday, April 24, 2017, and seizing gold in the 200-meter dash and shot-put events on Wednesday. Today she'll compete in the javelin throw. The sprightly great-grandmother has quickly become a sensation at the games, posing with peace signs for fans post-race and showing off her own victory dance to the crowd, while proudly sporting the number 10001 on her jersey. She was the only competitor in her age category for all of her medals, but her effort and determination have won her much admiration from spectators and other athletes alike. Born in Patiala in Punjab, Mann Kaur didn't become involved in athletics until she was 93, when her son began taking her to the Punjab University grounds and noticed she could run well. He'd taken part in the games and encouraged his mother to get involved when he saw other women from around the world competing. "She trains daily," Mann Kaur's 79-year-old son and coach, Gurdev Singh, said. "We eat good homemade food -- no fried food. No restaurant eating, every day wheat grass, nuts and seeds." Aside from a healthy diet, Mann Kaur's grandson Nirmal Singh said she also stays positive and keeps busy. Mann Kaur doesn't receive any professional training, but despite severe osteoporosis and a curved spine, the centenarian's health is good and she remains hopeful she'll continue to enjoy athletics in the future and even improve. "I will run as long as Guru's grace is with me. Although I am in such a state of health and I have improved my performance in these games, I will definitely perform better if there is some medical help," she said. Last summer, she competed in the American Masters Games in Canada in running, shot-put and javelin events. Her son said she's won more than 20 medals since she started competing in athletics. But perhaps most proud of Mann Kaur is her large family. She has three children, 10 grandchildren and 12 great-grandchildren. “I feel very good that she won," said granson Nirmal Singh. "Whenever she participates, she wins gold."